For the past two years he has been sitting on the fringes of the big Soca Monarch Competition as a reserve but this year he has no intention to do so as he is set to break that jinx and go all the way to the top with his scintillating hit tune âBikiniâ. Most people who are familiar with the name I-Ston would remember the talented artiste for his dynamic lyrics in the reggae genre. 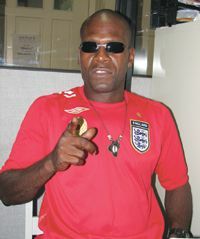 Winston âI-Stonâ Lewis, has been singing for the past 25 years; as early as when he was a student of the Carapan Secondary School. He said his inspiration for a number of years had come from listening to the renditions of legendary reggae artiste Bob Marley. âI remember folding my fist as a microphone and singing in class for the other kids who used to join with me,â I-Ston fondly recalled. While living in the United States of America he lived his dream as a reggae artiste performing with the band Papa-I-Ston and the Ronkers throughout the length and breadth of North America. On his return to St.Vincent and the Grenadines, though I-Ston continued singing reggae, the father of seven who originates from Orange Hill but now resides at Mt.Pleasant, continued to explore his talent and was able to branch off into the calypso field where he sang for about 10 years, some of those years with the Stars Calypso Tent. But with the Carnival fever in his veins, it dawned on I-Ston that there were other genres of music to be explored and as a result four years ago he started singing soca. âWhen Carnival comes around instead of sitting back on my talent Iâll do some songs. So itâs not like I am leaving reggae. I am just exploring my talent,â said the man who formerly wore dreadlocks. I-Ston is confident that âBikiniâ can accomplish much this year. He explained that he was motivated to write this song while visiting different picnic sites in St.Vincent and the Grenadines such as the beaches and the waterfalls where he observed Vincentian women heavily clad in long t-shirts and jeans though they wore bikinis beneath. I-Ston said this topic has been debated before throughout St.Vincent and the Grenadines and he is sure Vincentians will enjoy the debate that the song will ignite.